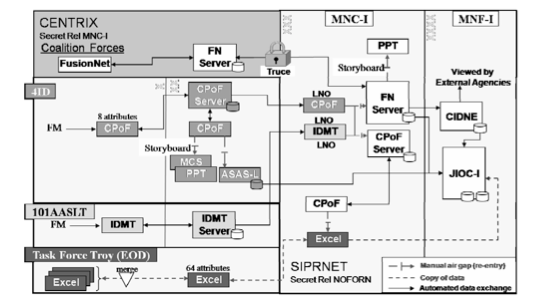 The animating core of the system was the SIGACT – shown below – and these were eventually fed into a single reporting and analysis platform, the Combined Information Data Network Exchange (CIDNE). Since I wrote, scholars have used SIGACT reports much more systematically to analyse the connective tissue between ethno-sectarian violence and the ‘surge’ – see, for example, Stephen Biddle, Jeffrey Friedman and Jacob Shapiro, ‘Testing the surge’, International Security 37 (1) (2012) 7-40; Nils Weidmann and Idean Saleyhan, ‘Violence and ethnic segregation: a computational model applied to Baghdad‘, International Studies Quarterly 57 (2013) 52-64 – to explore the political dynamics of civilian casualties – see, for example, Luke Condra and Jacob Shapiro, ‘Who takes the blame? The strategic effects of collateral damage’, American Journal of Political Science 56 (1) (2012) 167-87 – and to conduct more general evaluations of counterinsurgency in Iraq: see, for example, Eli Berman, Jacob Shapiro and Joseph Felter, ‘Can hearts and minds be bought? The economics of counterinsurgency in Iraq’, Journal of political economy 119 (4) (2011) 766-819. I’ve been revisiting these modelling exercises for The everywhere war, because they require me to rework my essay on ‘The biopolitics of Baghdad’ (though not, I think, to change its main argument). I’m struck by the idiom they use – my critique of spatial science written in another age would have been substantially different had it been less preoccupied with the detecting of spatial pattern, had its methods been applied more often to issues that matter, and had its architects been less convinced of the self-sufficiency of their methods. Now David Pinder has kindly drawn my attention to an extraordinarily suggestive essay by Graham Harwood, ‘Endless War: on the database structure of armed conflict’ over at rhizome, and to the art-work that is it subject, which together have returned me to my original interest in the ‘event-field’ of later modern war and the automated interactions between its data platforms. Graham’s central question is deceptively simple: ‘How does the way war is thought relate to how it is fought?’ SIGACTS populate the digital battlespace with events and invite a calculative and algorithmic apprehension of the field of military violence. To show what this means, Graham and his partner Matsuko Yokokoji (who together compose YoHa: English translation ‘aftermath’) joined with his Goldsmith’s colleague Matthew Fuller to produce an intriguing artwork, Endless War. 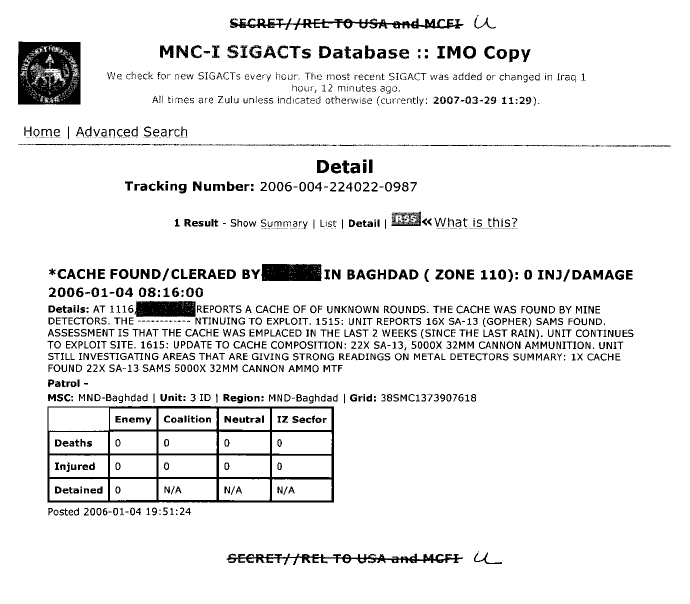 It processes the WikiLeaks Afghan War Diary data set as a collection of analytic viewpoints, both machine and human. A software-driven system, Endless War reveals the structure of these viewpoints by using N-gram fingerprints, a method that allows sorting of the text as an anonymous corpus without having to impose predetermined categories on it. Presented as a gallery installation, the system includes a computer that processes the data in real time, projections of the results, and coil pick-up microphones on the central processing unit that sonify the inner working of the machine. The torrent files released by WikiLeaks in 2010 are the residue of the system that created them, both machine and human. They seem to hint at the existence of a sensorium, an entire sensory and intellectual apparatus of the military body readied for battle, an apparatus through which the Afghan war is both thought and fought. 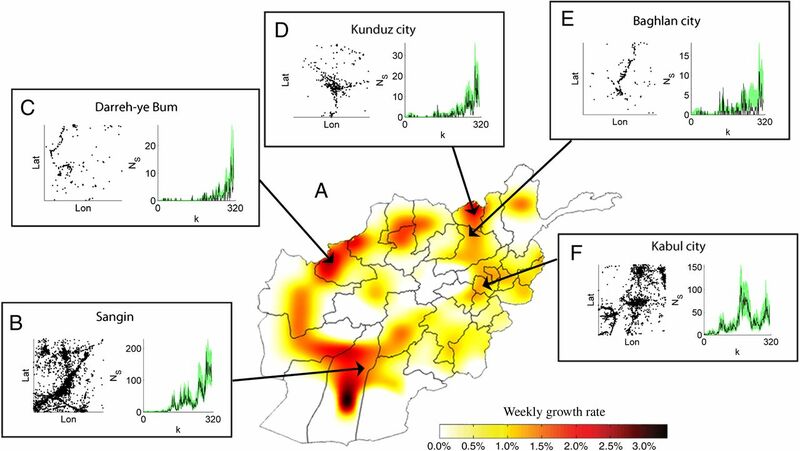 Just as an algorithm is an ‘effective procedure’, a series of logical steps required to complete a task, the Afghan War Diary shows war as it is computed, reduced to an endless permutation of jargon, acronyms, procedure recorded, cross-referenced and seen as a sequence or pattern of events. Endless War is not a video installation but a month-long real-time processing of this data seen from a series of different analytical points of view. (From the point of view of each individual entry; in terms of phrase matching between entries; and searches for the frequency of terms.) As the war is fought it produces entries in databases that are in turn analysed by software looking for repeated patterns of events, spatial information, kinds of actors, timings and other factors. Endless War shows how the way war is thought relates to the way it is fought. Both are seen as, potentially endless, computational processes. The algorithmic imaginary of contemporary power meshes with the drawn out failure of imperial adventure. This entry was posted in Afghanistan, art, counterinsurgency, Iraq, late modern war, technology by Derek Gregory. Bookmark the permalink.